So reads one of the quotes on the back of the program for the Baldwinsville Bees Boys Hockey team’s Teacher Appreciation Night last week at the Greater Baldwinsville Ice Arena. Each member of the team invited a teacher to the ceremony who wore the player’s jersey. 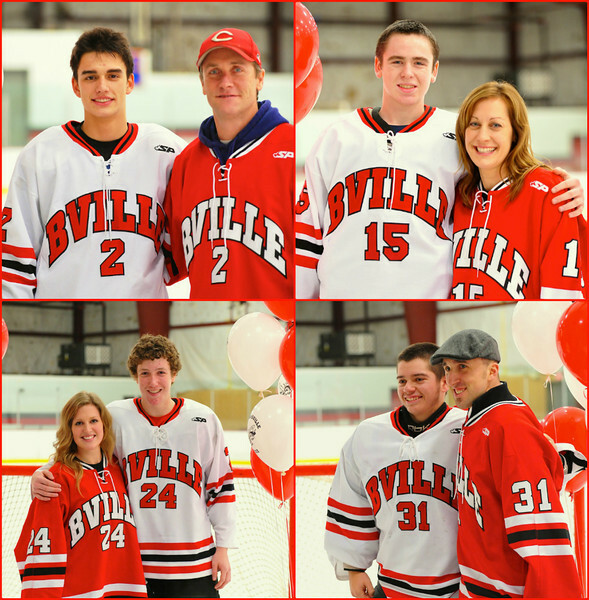 A few of the Player/Teacher photographs from the Baldwinsville Bees Boys Hockey Team’s Teacher Appreciation Night. Each player wrote a short paragraph of why they chose their teachers for the ceremony which was read over the loud speaker to the parents, teachers, students and fans at the game. Teachers were given a gift bag by each player as they posed with their student athletes for photos on the ice. You can tell by their faces, the teachers were thrilled to be there. 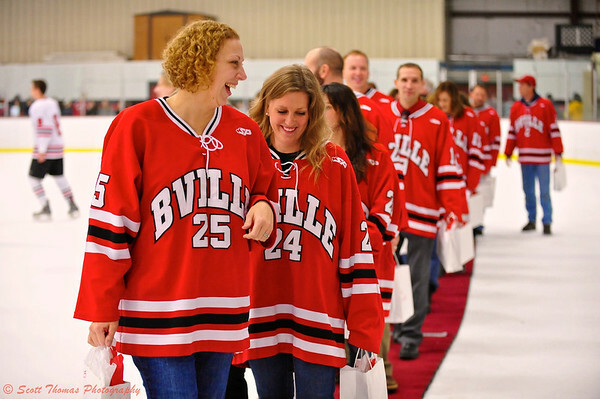 Teachers with their gift bags, walk off the ice after the Teacher Appreciation Night Ceremony. Nikon D700/70-200VR, 1/400s, f/2.8, ISO 4500, EV +0.6, 70mm focal length. Getting the teachers out of the classroom and into an environment where players, students and parents are more at ease allowed for mingling before, during and after the game. 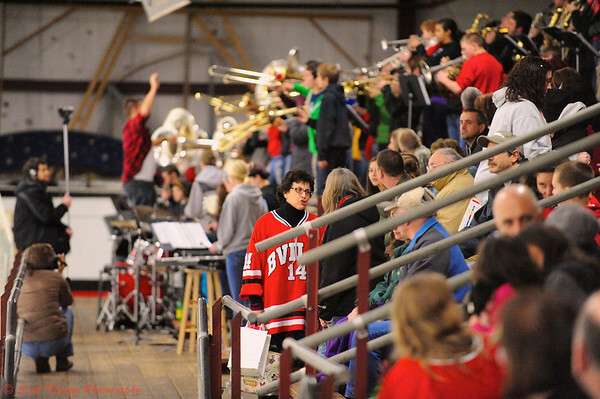 A teacher talks with parents after the Teacher Appreciation Night ceremony at the Baldwinsville Bees hockey game. Nikon D700/70-200VR, 1/500s, f/2.8, ISO 8000, EV +1.3, 200mm focal length. If you are interested in the game, click on this link as the Bees won 4-2 over the F-M Hornets. This entry was posted in Sports, Weekly View and tagged 70-200mm, appreciation night, baldwinsville, bees, boys, gbia, hockey, ice, men, new york, nikon D700, players, teacher, vr, women. Bookmark the permalink. That is one of the best school-related ideas I’ve ever heard. Looks like there were a whole lot of champions at the ice arena last week. Congratulations to all of them – and thank you for the joyful photos and story. You get to the heart of things, Scott. I think all the teachers were very happy to have their students do this for them. All the dedications were well done. Thank you for saying that, Gerry. Thank you, KD! Kids are always being recognized for their achievements so it was very nice to see the engines of those achievements, the teachers, get some in return.